Hanami is a gorgeous tribute to Japanese "flower viewing" (Hanami). 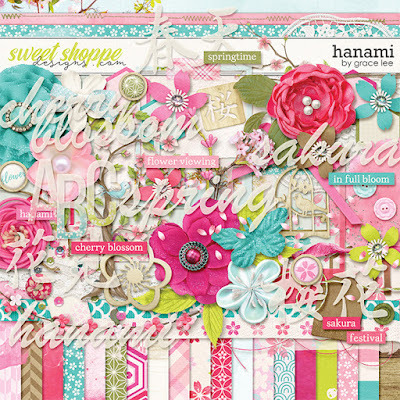 This collection is a new and improved version of a retired kit called "Cherry Blossom." The soft subtle colors and pops of fuchsia and teal are perfect as spring blossoms to compliment multiple layouts of family spring events, world travels or a relaxing walk through your local botanical gardens. This kit is also included in a bundle!